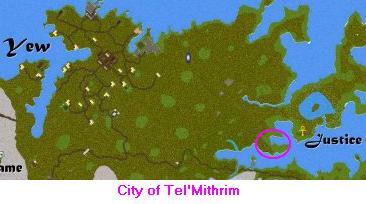 Last edited by Verity – Apr 20 99The Village of Tel’Mithrim is located out near the Shrine of Justice. It is populatedmostly by Elves (an Elven Role Playing Guild). The Elvish race have their own language,but all know the human tongue. If you wish to greet them, the proper greeting is”Vedui” or “Mae Govannen”. There are 30 to 40 residents. The village contains the Silver Arrow Tavern, and many other public shops. I was charged a fee just for walking thru town on my way to the bar. Not very friendly towards non-elves.